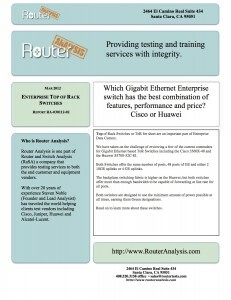 In this report I cover the Cisco WS-3650-X-48 vs the Huawei S5700-52C-EI. Both are capable and well matched 48 port GE switches with 10GE uplinks, but which one is the best? This report is no longer being distributed as we are preparing to do a new report with more vendors, more testing and a wider focus. Why did you cover Huawei but not Juniper? Juniper has the EX3200 switch which is imho better than the Cisco. The Juniper supports 16k routes while the Cisco only supports 11k max. I would like to have more information about this report. Could you help me with the steps please? What information are you looking for? We have not finished testing all of the equipment covered in the report, if there is a box that you are specifically interested in, please let us know. I am currently in a situation with a client where we have proposed Huawei S5700’s and the client would prefer Cisco 3750’s. Please could you share the report for our information. Sorry, that should be addressed to Steven Noble, not Miguel. There can be many reasons that people want to go with Cisco instead of Huawei, most of it is FUD but some reasons are real. The general FUD has always been about “backdoors” in Huawei’s code, even if they exist (there is no proof) a good network design will always protect the router/switch from external access. Real issues can be software support, which is done very differently at Huawei compared to Cisco. Also physical support which depends on the customers location. When I put together this report, I had negotiated having a Huawei S5700 in hand shortly so that I could put meaningful data into it. I still have not been able to get one physically in my lab, so all of my testing has been remote and limited. I will drop you a private note and we can go from there.